In this simple, elegant card game, players match colors and make snakes from heads to tails. Long snakes, short snakes, purple, yellow and rainbow snakes. Finish a snake and add it to your snake pit. The player with the most snakes at the end of the game wins. This is a great way for an older child to interact with a younger sibling. Also fun to play solo, just building snakes. A GREAT first game for learning to take turns. This is a great quick game that is simple, fun, and easy to learn. It is well-suited for young players, but it can be enjoyed by older players as well, making it perfect for a fast family diversion. The premise is very staightforward and simple. The players take turns drawing and playing snake tiles of various colors to try to complete snakes. To add on to a snake, you have to have a piece that matches the color of one currently in play. Each snake has to have a head, a tail, and at least one midsection. 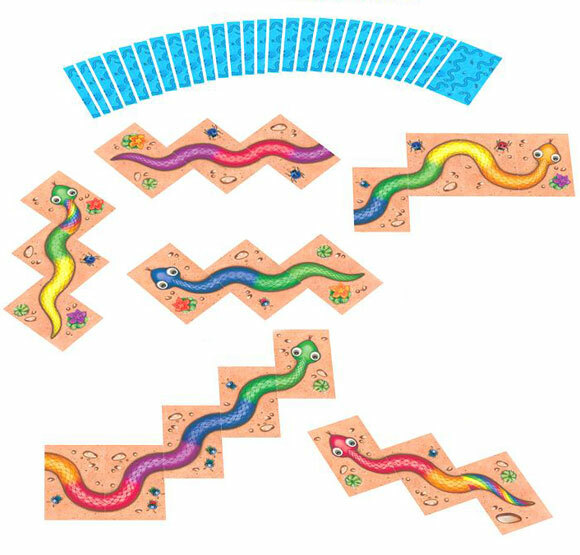 If you complete a snake you get all those tiles, and the person with the most pieces when the last tiles are played wins the game. The components are great, with nice chunky cardboard tiles. The snake pieces are very colorful and wonderfully illustrated, with lots of little details in the background. When not playing the game, our 5 year-old daughter just enjoys making as long a snake as possible. One of the things that makes the game fun is the fact that it requires players to make decisions nearly every turn. Players are often faced with a choice of where to place their tiles and have to decide to risk extending a snake that someone else might get or make shorter snakes for less points. The game is definitely geared towards a younger crowd and is great as an introductory game, especialy for toddlers and preschoolers. It provides an excellent opportunity to learn more about colors, matching skills, and counting. Additionally, the decision-making aspect can make the game enjoyable for older siblings. Overall, I think this is a great game for young children and families. It is extemely easy to learn and plays very quickly, so kids stay engaged. It can be a lot of fun for the whole family, even one with older siblings, and it provides ample opportunities to reinforce color-matching skills. It is definitely one to look for if you’re interested in a game for kids that involves more than just rolling the dice and moving around a board. We have quite a few easy kid’s games in our cabinet that got our kids into board games, but the two games most played were Animal Upon Animal and Hisss. What makes Hisss so compelling to children? The snakes are very simple cartoon creations with bright colors that are easily identifiable as red or orange (little ambiguity) or blue or green or purple. Other little bug touches make the cards more fun… and the rainbow wild cards are always the favorites. The component quality for toddlers is second to none. Big, thick cards make this the perfect game for toddlers who may still like to chew… or have some sort of liquid still on their little paws. Our game made it through two dirty boys. The game is simple to learn, but requires simple decision-making skills… a perfect way to introduce game skills to a child without overwhelming them. All you have to do is match colors, have a tail on one end, and a head on the other. Eventually, you can teach them how to count the cards they’ve won. The game is over quickly. This is one of the MOST important aspects of a toddler game. The game must be over before the parent commits suicide. Hisss is perfect in this regard. Besides being a somewhat painless affair to begin with, the game is over before you or your child get tired of it. If you have a young child and like playing games, you owe it to yourself to have Hisss in the cabinet. It’s the perfect gateway game for toddlers. We love this game on game nights because it gives our younger kids a chance to play a game with their older siblings. Unlike so many games designed for younger kids (e.g. Chutes & Ladders, Candyland, and Mousetrap), Hisss allows the players to make decisions. Which snake should I extend? Where should I play this rainbow card? It also helps with counting and color recognition. The cards are beautifully illustrated and made to last. Perfect for kids under 6. We also like how quickly the game plays. We can play it a few times at the start of the evening, let the younger kids play it among themselves while we older folks play something else, and get in a few more games during our intermissions. My son received this game as a gift when he was 3, but at age 5 he still enjoys a good round, and my older kids often pitch in, too. I love the simplicity of this game. Very young children can pick up the game play right away. The cards are also wonderfully sturdy, which seems to be a little too rare these days. On top of it all, the illustrations are terrifically charming and friendly. The only drawback is that it does not hold attention more than a round or two. Still, a very fun problem solving game for young kids. When you are pulling your hair out after playing Candyland for the millionth time it is time to find something else (parents of 4-6 year olds know what I’m talking about). We found Hisss and love playing it with our little girl. She gets so excited to pull the rainbow head or tail and complete a long snake. We play time and again and it is great to see her develop recognition of where pieces could be played and how things connect and then count to see who had the longest snake. It is easy to teach and after a few days we very rarely have to help her find where a piece can go. Sometimes we give her hints on how to link up snakes to make them longer and win them but otherwise she is completely independent. Recommended for families with pre-K to 6 year old children who can’t stand the classic board games aimed at that age. Some of my other reviews are geared toward younger age kids, check them out. This game is one I bought with my kids in mind. They really like it. It is easy enough for just about anyone to pick up on. No reading, math or anything but matching colors. The whole game centers around pulling a card and matching the color to build a snake. My Children love the game. They get excited to see how big they can get the snakes. I get into it too when playing with them. It’s nice to have a game that we can enjoy together. Well worth the price if you are looking for something you can share with children and enjoy doing with them. Add a Review for "Hisss"